Ryan Sweeney (another player brought in for the Swisher) was packaged with Andrew Bailey to obtain Josh Reddick. 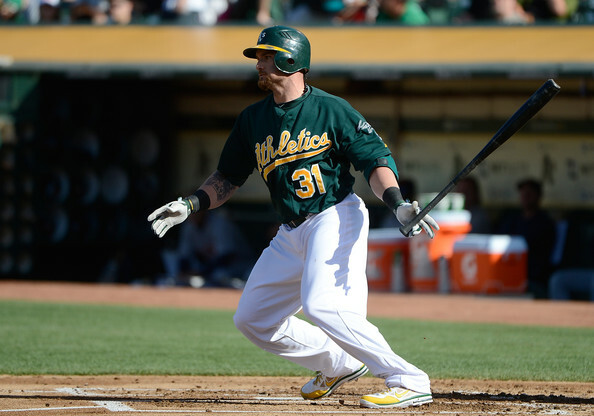 Jonny Gomes was brought back to the bay (accompanying ace start Jon Lester last week) for Yoenis Cespedes. The Boston theme doesn’t end there, former Boston Red Sox Draft Pick Brandon Moss, inked a Free Agent deal with the A’s prior to the 2012, when he career looked like it was headed nowhere. Jed Lowrie (another ex-Boston player) was brought to the club by trading away Chris Carter (acquired from the D’Backs) for the big Dan Haren deal. Meanwhile, half way through this post, I realized I have named half of the pitchers for the Rotation Roster Tree as well. That Arizona deal kept giving – as the club parlayed Brett Anderson for Drew Pomeranz, who is under Team Control for several more years – while having nice little stint in the Majors this year. The D’Backs also were fleeced in a few deals on the pitchers side, but that is a blog for another day, you can view the April post I did for that, but it has not been updated quite yet. Beane might have lost out on Matt Holliday helping him with many assets, however it was the 2004 trade of Mulder – that has his team with several assets still in a roster tree way. Holliday was gone at the end of the 2009 campaign. The team still has Shane Peterson at AAA, and he is raking at his best ever averages across the board at age 25. After trading Brett Wallace for Michael Taylor, the A’s GM then flipped him for Jake Sanchez, (currently a chucker in A+ ball Stockton) for Oakland’s Minor League system. Josh Donaldson‘s tree ended up tracing back to the club trading away Rich Harden at exactly the right time. Talking about some Beane magic. Joe Blanton can also be traced to the current asset of Luke Gregerson. Of course Beane is still baseball best “Rounder”. He always acquires more assets – without surrendering as much, and is able to sell high on a lot of his guys before they lost value. How you do this, is trading your veterans for multiple players in deals, and having them work out at a better rate ( and for longer periods) – than the guy you traded. Oakland’s front office (not all of it is Beane), also has drafted well, claimed guys on waivers, signed Free Agents (MiLB, International and outright open market players) on several occasions that have fared out better with the team than other organizations. Now that Cespedes is no longer there, every single player on offense was acquired after they started their career in another organization. You don’t do that, and have the best record in the MLB since the start of 2012, without winning the majority of the maneuvers done. Really, with the amount of the players departed since leaving Oakland, who has really burned the franchise? Holliday has been a solid member of the Cards, but again, he was a pending Free Agent. Huston Street has been an awesome reliever since leaving the squad, however he has carried a hefty price tag. Carlos Gonzalez is a superstar, but he can’t stay on the field – despite playing elite ball. Plus remember that it was a 5 – 2 deal with Haren and A’s draft selection Connor Robertson jettisoned to Arizona for Gonzalez, Anderson, Carter, Cunningham and Eveland. I will say I never agreed in the Carter/Lowrie deal, as the power hitting Astros 1B/OF slugger is a 30 HR a guy year, but the A’s were already loaded with Brandon Moss, and many other DH/1B/OF types. Besides, a little secret to this, is that Houston had to make room on their depth chart, so they had to put Nate Freiman on Waivers, to create room for the incoming A’s players. Beane maybe saw this, and claimed the 1B, knowing full well he had to stay on the MLB Roster for a full year, or be sent back to the Padres. I fully think he outfoxed the Astros brass on that one. You might as well add Freiman to that transaction. 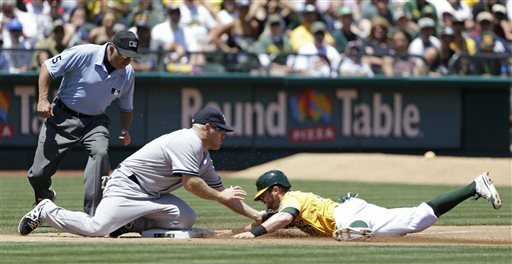 Whether Freiman can step up his game remains to be seen. Speaking of 1B, the club still has Daric Barton in the Minors for the Mulder deal. The former LHP only won 22 games after leaving Oakland – and was paid handsomely. The “Moneyball” GM also has traded away a bushel full of starters and relievers, to acquire hitters in return. 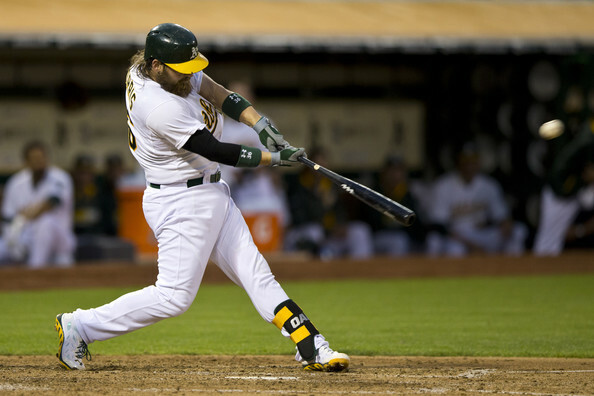 In the Jaso deal, he traded away SP A.J. Cole, and Minor League Pitchers Ian Krol and Blake Treinen, to secure a player who has gone .270/.365/.410 – which is the epitome of his philosophy. Hopefully the A’s will capitalize with a World Series so we can see Brad Pitt and Jonah Hill come back for a movie sequel. With nearly 50 transactions a year since taking over, Beane will continue to monitor his organization depth chart board – with his brass, and look to help keep improving his team. Derek Norris (2/14/89) C: December 23, 2011: Traded by the Washington Nationals with A.J. Cole (minors), Tommy Milone and Brad Peacock to the Oakland Athletics for Robert Gilliam (minors) and Gio Gonzalez. Gio Gonzalez (9/19/85) SP: January 3, 2008: Traded by the Chicago White Sox with Fautino De Los Santos and Ryan Sweeney to the Oakland Athletics for Nick Swisher. Nick Swisher (11/25/80) 1B/RF/DH: Drafted by the Oakland Athletics in the 1st round (16th pick) of the 2002 amateur draft. Robert Gilliam (11/28/87) P: Drafted by the Oakland Athletics in the 8th round of the 2009 MLB June Amateur Draft. 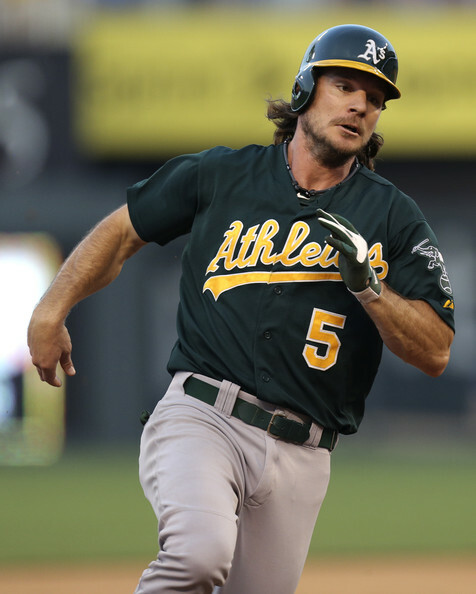 John Jaso (9/19/83) C/1B/DH: January 16, 2013: Traded as part of a 3-team trade by the Seattle Mariners to the Oakland Athletics. The Oakland Athletics sent a player to be named later, A.J. Cole (minors) and Blake Treinen to the Washington Nationals. The Washington Nationals sent Mike Morse to the Seattle Mariners. The Oakland Athletics sent Ian Krol (March 20, 2013) to the Washington Nationals to complete the trade. A.J. Cole (1/5/92) SP : Part of the original Deal and used to acquire Jaso. Ian Krol (5/9/91) RP: Drafted by the Oakland Athletics in the 7th round of the 2009 amateur draft. Blake Treinen (6/30/88) P: Drafted by the Oakland Athletics in the 7th round of the 2011 amateur draft. Tommy Milone (2/16/87) SP: July 31, 2014: Traded by the Oakland Athletics to the Minnesota Twins for Sam Fuld. 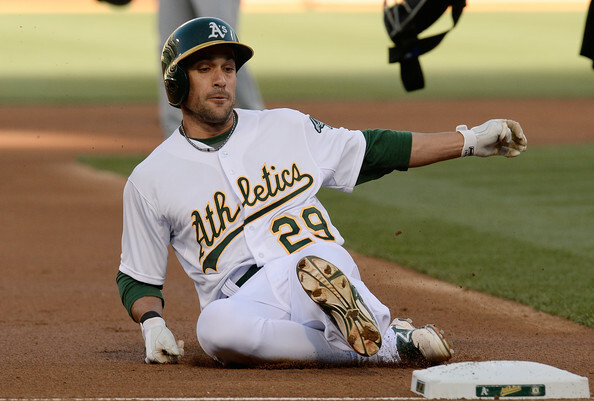 Sam Fuld (11/20/81) OF: Is with the A’s for a 2nd time this year. He was claimed off of waiver By Minnt earlier in the year. Brad Peacock (2/2/88) SP: February 4, 2013: Traded by the Oakland Athletics with Chris Carter and Max Stassi to the Houston Astros for Jed Lowrie and Fernando Rodriguez. Jed Lowrie (4/17/84) 2B/SS: Lowrie is in the final year of his contract right now. Fernando Rodriguez (6/18/84) RP: Is pitching with Sacramento in the AAA right now for the A’s system. Had a nice 6 game stretch in May with Oakland. Max Stassi (3/15/91) DH/C: Drafted by the Oakland Athletics in the 4th round of the 2009 amateur draft. Chris Carter (12/18/86) DH/1B/OF; December 14, 2007: Traded by the Arizona Diamondbacks with Brett Anderson, Aaron Cunningham, Dana Eveland, Carlos Gonzalez and Greg Smith to the Oakland Athletics for Dan Haren and Connor Robertson. Dan Haren (9/17/80) SP: December 18, 2004: Traded by the St. Louis Cardinals with Daric Barton and Kiko Calero to the Oakland Athletics for Mark Mulder. Daric Barton (8/16/85) 1B: Is still with the franchise, even after all of these years and AB. and being down on the bench. Kiko Calero (1/9/75) P: June 27, 2008: Released by the Oakland Athletics. Mark Mulder (8/5/77) SP: June 2, 1998: Drafted by the Oakland Athletics in the 1st round (2nd pick) of the 1998 amateur draft. Connor Robertson (9/10/81) P: Drafted by the Oakland Athletics in the 31st round of the 2004 amateur draft. Brett Anderson (2/1/88) SP: December 10, 2013: Traded by the Oakland Athletics with cash to the Colorado Rockies for Chris Jensen (minors) and Drew Pomeranz. Drew Pomeranz (11/22/88) P: Is with Sacramento currently, but saw time as a SP and RP this year. Chris Jensen (9/30/90) P: Has started all of 2014 with Midland (AA A’s affiliate). Dana Eveland (10/29/83) P: February 7, 2010: Purchased by the Toronto Blue Jays from the Oakland Athletics. Greg Smith (12/22/83) P: November 10, 2008: Traded by the Oakland Athletics with Carlos Gonzalez and Huston Street to the Colorado Rockies for Matt Holliday. Huston Street (8/2/83) CL: Drafted by the Oakland Athletics in the 1st round (40th pick) of the 2004 amateur draft. Matt Holliday (1/15/80 OF: July 24, 2009: Traded by the Oakland Athletics to the St. Louis Cardinals for Clayton Mortensen, Shane Peterson and Brett Wallace. Shane Peterson (2/11/88) OF/1B: Is with the AAA Sacramento club currently. Clayton Mortensen (4/1/85) P: January 24, 2011: Traded by the Oakland Athletics to the Colorado Rockies for Ethan Hollingsworth (minors). Ethan Hollingsworth (5/4/87) September 27, 2011: Acquired by the Kansas City Royals to the Oakland Athletics for Kila Ka’aihue. Kila Ka’aihue (3/29/84) 1B/DH November 3, 2012: Granted Free Agency. Brett Wallace (8/26/86) 1B/OF: December 16, 2009: Traded by the Oakland Athletics to the Toronto Blue Jays for Michael Taylor. Jake Sanchez (8/19/89) SP: Has been starting in A+ Stockton in 2015. Aaron Cunningham (4/24/86) OF: January 16, 2010: Traded by the Oakland Athletics with Scott Hairston to the San Diego Padres for Kevin Kouzmanoff and Eric Sogard. Eric Sogard (5/22/86) 2B: Is currently with the big team. Kevin Kouzmanoff (7/25/81) 3B: August 23, 2011: Sent to the Colorado Rockies by the Oakland Athletics as part of a conditional deal. Scott Hairston (5/25/80) OF/PH/2B: July 5, 2009: Traded by the San Diego Padres to the Oakland Athletics for a player to be named later, Craig Italiano (minors) and Ryan Webb. The Oakland Athletics sent Sean Gallagher (July 28, 2009) to the San Diego Padres to complete the trade. Craig Italiano (7/22/86/) P: Drafted by the Oakland Athletics in the 2nd round of the 2005 MLB June Amateur Draft. Ryan Webb (2/5/86) P: Drafted by the Oakland Athletics in the 4th round of the 2004 amateur draft. Sean Gallagher (12/30/85) P: July 8, 2008: Traded by the Chicago Cubs with Josh Donaldson, Matt Murton and Eric Patterson to the Oakland Athletics for Chad Gaudin and Rich Harden. 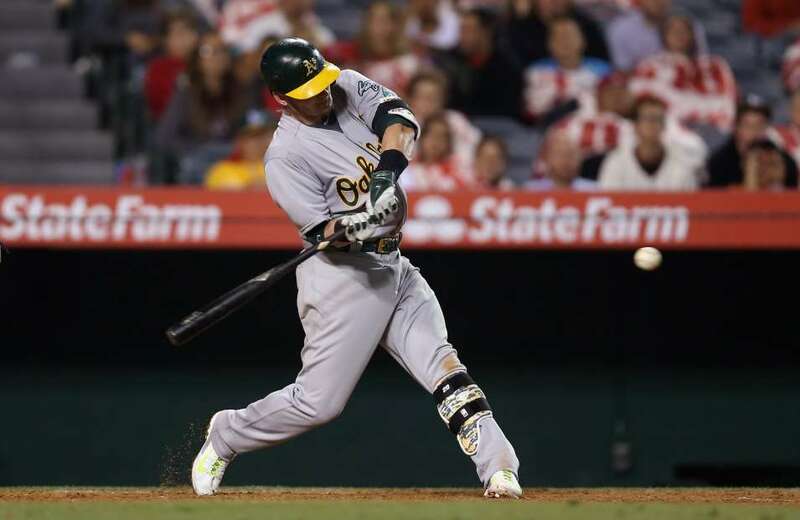 Josh Donaldson (12/8/85) 3B: Has played great baseball for the A’s since start of 2013. Matt Murton (10/3/81) LF/PH: February 4, 2009: Traded by the Oakland Athletics to the Colorado Rockies for Corey Wimberly (minors). Corey Wimberly (10/26/83) 2B/OF/SS: Dec.23, 2010 Traded By the A’s to the Pirates for Ryan Kelly. Ryan Kelly (10/30/87) P:January 8, 2011: Traded by the Texas Rangers to the Oakland Athletics for Ryan Kelly (minors). Guillermo Moscoso (11/14/83) P: January 16, 2012: Traded by the Oakland Athletics with Josh Outman to the Colorado Rockies for Seth Smith. Seth Smith (9/30/82) OF/DH: December 3, 2013: Traded by the Oakland Athletics to the San Diego Padres for Luke Gregerson. Luke Gregerson (5/14/84) RP: The bullpen reliever is Free Agent after the 2014 season. Josh Outman (9/14/84) RP: July 17, 2008: Traded by the Philadelphia Phillies with Matthew Spencer (minors) and Adrian Cardenas to the Oakland Athletics for Joe Blanton. Matthew Spencer (1/7/86) OF/1B: December 3, 2009: Traded to the Cubs with Ronny Morla and Jeff Gray for Jake Fox and Aaron Miles. Jake Fox (7/20/82) PH/LF/C: June 22, 2010: Traded by the Oakland Athletics to the Baltimore Orioles for Ross Wolf. Ross Wolf (10/18/82) P: October 12, 2010: Granted Free Agency. Ronny Morla (5/19/88) P: Signed as an Undrafted Free Agent in 2008 with the A’s. Jeff Gray (11/19/81) P; Drafted by the Oakland Athletics in the 32nd round of the 2004 amateur draft. Adrian Cardenas (10/10/87) PH/LF/2B: February 6, 2012: Selected off waivers by the Chicago Cubs from the Oakland Athletics. Joe Blanton (12/11/80) SP: June 4, 2002: Drafted by the Oakland Athletics in the 1st round (24th pick) of the 2002 amateur draft. Eric Patterson (4/18/83) LF/2B: June 26, 2010: Traded by the Oakland Athletics to the Boston Red Sox for Fabian Williamson (minors). Fabian Williamson (10/20/88) P: Dec. 11, 2010 Williamson was claimed by the Rangers off of waivers. Chad Gaudin (3/24/83) SP: December 2, 2005: Traded by the Toronto Blue Jays to the Oakland Athletics for a player to be named later. The Oakland Athletics sent Dustin Majewski (minors) (December 8, 2005) to the Toronto Blue Jays to complete the trade. Dustin Majewski (8/16/81) OF: Drafted by the Oakland Athletics in the 3rd round of the 2003 MLB June Amateur Draft. Rich Harden (11/30/81) SP: Oakland Athletics in the 17th round of the 2000 MLB June Amateur Draft. Brandon Moss (9/16/83) OF/1B: December 1, 2011: Signed as a Free Agent with the Oakland Athletics. 2 more years left of eligibility. Nate Freiman (12/31/86) 1B: March 23, 2013: Selected off waivers by the Oakland Athletics from the Houston Astros. Coco Crisp (11/1/79) CF: December 23, 2009: Signed as a Free Agent with the Oakland Athletics. 2 YRs/$10.75 MIL. Josh Reddick (2/19/87) OF: December 28, 2011: Traded by the Boston Red Sox with Raul Alcantara (minors) and Miles Head (minors) to the Oakland Athletics for Andrew Bailey and Ryan Sweeney. Raul Alcantara (12/4/92) SP: Is a starter in Midland (AA) for the A’s organization. Miles Head (5/2/91) 1B/3B/DH; Is a positional player for Midland this year of 2014. Andrew Bailey (5/31/84) RP: Drafted by the Oakland Athletics in the 6th round of the 2006 amateur draft. Ryan Sweeney (2/20/85) OF: January 3, 2008: Traded by the Chicago White Sox with Fautino De Los Santos and Gio Gonzalez to the Oakland Athletics for Nick Swisher. Fautino De Los Santos (2/15/86) P: July 28, 2012: Traded by the Oakland Athletics to the Milwaukee Brewers for George Kottaras. George Kottaras (5/10/83) C: January 25, 2013: Selected off waivers by the Kansas City Royals from the Oakland Athletics. Stephen Vogt (11/1/84) C/1B: April 6, 2013: Sent to the Oakland Athletics by the Tampa Bay Rays as part of a conditional deal. Craig Gentry (11/29/83) CF: December 3, 2013: Traded by the Texas Rangers with Josh Lindblom to the Oakland Athletics for Chris Bostick (minors) and Michael Choice. Josh Lindblom (6/15/87) P: Lindblom has spent themajority of the year in Sacramento stretching out as a starter. Michael Choice (11/10/89) OF: Drafted by the Oakland Athletics in the 1st round (10th pick) of the 2010 amateur draft. Kyle Blanks (9/11/86) OF/1B: May 15, 2014: Traded by the San Diego Padres to the Oakland Athletics for a player to be named later and Jake Goebbert. The Oakland Athletics sent Ronald Herrera (minors) (May 28, 2014) to the San Diego Padres to complete the trade. Jake Goebbert (9/24/87) PH/1B/LF: April 4, 2013: Traded by the Houston Astros to the Oakland Athletics for Travis Blackley. Travis Blackley (11/4/82) P: May 15, 2012: Selected off waivers by the Oakland Athletics from the San Francisco Giants. Ronald Herrera (5/3/95) P; Signed as an International Free Agent in 2011. 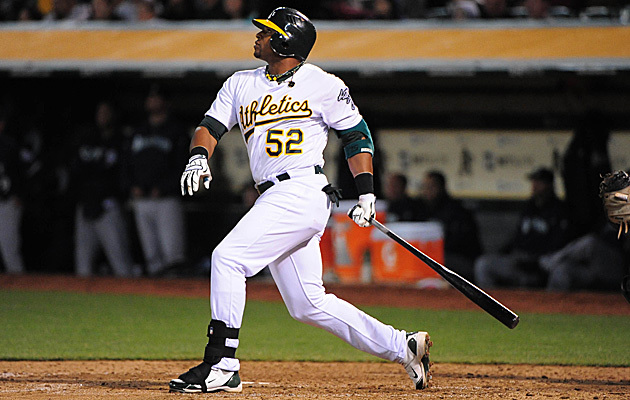 Alberto Callaspo (4/19/83) INF July 30, 2013: Traded by the Los Angeles Angels of Anaheim to the Oakland Athletics for Grant Green. Grant Green (9/27/87) INF/OF; Drafted by the Oakland Athletics in the 1st round (13th pick) of the 2009 amateur draft. Jonny Gomes (11/22/80) OF/DH: July 31, 2014: Traded by the Boston Red Sox with Jon Lester and cash to the Oakland Athletics for Yoenis Cespedes and 2015 compensation draft pick. Yoenis Cespedes (12/18/85) OF: February 13, 2012: Signed by the Oakland Athletics as an amateur free agent. 4 YRs/$36 MIL. Posted on August 9, 2014, in MLB Roster Trees and tagged aaron cunningham, aaron miles, aj. cole, alberto callaspo, andrew bailey, billy beane, blake treinen, boston red sox, brad peacock, brad pitt, brandon moss, brett anderson, brett wallace, carlos gonzalez, chad gaudin, chris bostick, chris carter, Chris Jensen, clayton mortensen, coco crisp, colorado rockies, connor robertson, corey wimberly, craig gentry, craig italiano, dan haren, dana eveland, daric barton, derek norris, drew pomeranz, dustin majewski, eric patterson, eric sogard, Ethan Hollingsworth, fabian williamson, fautino de los santos, fernando rodriguez, george kottaras, grant green, greg smith, Guillermo Moscoso, huston street, jake fox, Jake Goebbert, jake sanchez, jed lowrie, jeff gray, joe blanton, john jaso, jon lester, jonah hill, josh donaldson, josh lindblom, josh outman, josh reddick, kevin kouzmanoff, kiko calero, kila ka'aihue, kyle blanks, luke gregerson, mark Mulder, matt holliday, matt murton, matthew spencer, Max Stassi, michael choice, michael taylor, midland AA, Mike Morse, miles head, moneyball, nate freiman, nick swisher, oakland athletics 2014 hitters roster, raul alcantara, rich harden, robert gilliam, ronald herrera, ronny morla, ross wolf, ryan kelly, ryan Sweeney, ryan webb, sacramento AAA PCL, san diego padres, scott hairston, sean gallagher, seattle mariners, seth smith, Shane Peterson, steven bogt, Stockton Ports (CAL) Pat Filippone, tampa bay rays, tommy milone, toronto blue jays, Travis Blackley, washington nationals, yoenis cespedes. Bookmark the permalink. 1 Comment.